"For the avoidance of doubt ... we wish to make it abundantly clear that the Peoples' Jubilee Process scheduled for 6th March 2007 is going ahead. "The CJA referred to statements by the Tertiary Students Confederacy (TESCON) of the New Patriotic Party (NPP), a group calling itself the Campaign for Patriotism (CAP) and the police on the proposed march and said they were meant to stop them. "All these statements are clearly designed to prevent the lawful exercise of our right to participate peacefully in the 50th anniversary as free citizens in a manner of our choosing rather than in a manner imposed by the state machine. "The CJA said it wanted to provide "a popular platform for the masses as an alternative to the essentially elitist Ghana@50 programme". "We hope to underline the political significance of Ghana's independence as an important victory in the worldwide struggle of the ordinary people against elitism. "We wish to celebrate Kwame Nkrumah, the pre-eminent strategist and tactician of the struggles against classical colonialism." 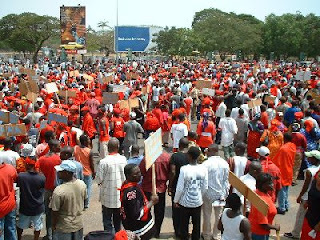 CJA said threats by TESCON and CAP to stage counter demonstrations and the Police to confront the CJA marchers demonstrated "clearly their utter contempt for the constitution and the citizenry".